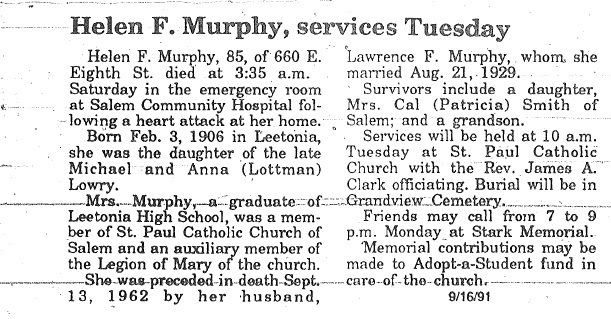 Helen F. Lowry Murphy was my great grant aunt, the younger sister of my great grandfather Charles E Lowry. She was born in Leetonia, Ohio in 1906 and lived her entire life there. She married her husband Lawrence Francis Murphy on Wednesday, August 21, 1929. She died of a heart attack in 1991 at age 85. This is her obituary from the Salem News.